Let me state that this is not a tutorial on how to develop manos de piedra - "hands of stone" - which is the famous moniker of prizefighter Roberto Duran. My use of a provocative title may be misleading. For the record I don't subscribe to the idea that hands can be conditioned into something akin to an anvil . Hands did not evolve to break open body parts and certain traditional training methods to toughen them can wreak havoc. Actually, this post was inspired by an impromptu sparring session I had this past weekend (my first in quite a while) that resulted in the first two knuckles on my left hand to swell to frightening proportions. I wore cotton hand-guards that leave the fingers exposed, and while my striking force was left in reserve for the most part, apparently, that wasn't good enough. This is really the result of chronic damage from years of sparring. (Note to readers: When you feel pain from an activity, stopping said activity is advised.) A colleague told me I should perform pushups on my knuckles to avert future injury. 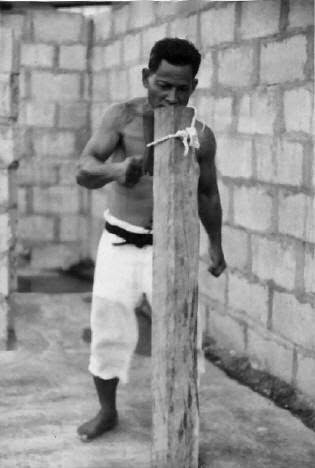 Another suggested training on a more time-honored method: The makiwara. I don't think so to either one. There's a market that offers a wide range of liniments with names like "Iron Hit Wine" and "Tiger Balm" that, while pricey at roughly $20 for a 2 oz. dose, provides a more sanitary method of treatment than urine. Once during an Isshinryu karate demonstration held for US marines on Okinawa, Tatsuo Shimabuku cut his hand while driving a spike through a slab of wood. There was no liniment or any first-aid handy, so in a pinch he applied some dirt to the wound to stop the bleeding. There's a tenet of unknown origin that advises to "attack soft tissue with a hard-surface hand-strike, and a hard area with a soft-surface hand-strike." Hammerfist, shuto (blade-hand), and palm-heel use the fleshier part of the hand that tend to be less injurious than a closed-fist if your target area is someone's head. In boxing, heavy hitters occasionally break their hands delivering the KO punch, this in spite of wrapping their hands in plenty of gauze and donning 10 or 12 oz. gloves. You'll also never see a boxer hit any kind of a bag without gloves. And some karate men, such as Isshinryu's Angi Uezu, have been known to doggedly hit that makiwara bare-handed. Somebody's wrong here. 1. Mark Bishop 1999. Okinawan Karate: Teachers, styles and secret techniques. Tuttle Publishing. 3. Patrick McCarthy 1995. The Bible of Karate: Bubishi. Tuttle Publishing.